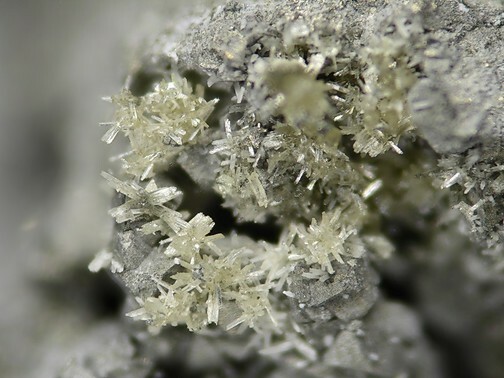 Rozenite: Mineral information, data and localities. 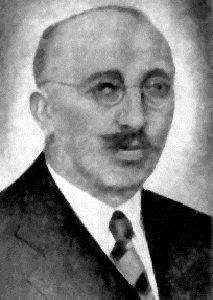 Named in honor of Zygmunt Rozen (16 May 1874, Zbaraj, Poland (now Ukraine) – 29 May 1936, Kraków, Poland), mineralogist and petrographer, Academy of Mining and Metallurgy, Kraków, Poland. A common alteration product of iron sulphides (pyrite, marcasite, pyrrhotite). Academy of Mining and Metallurgy, Kracow, Poland. Pyrite 8 photos of Rozenite associated with Pyrite on mindat.org. Marcasite 7 photos of Rozenite associated with Marcasite on mindat.org. Melanterite 4 photos of Rozenite associated with Melanterite on mindat.org. Tetrahedrite 3 photos of Rozenite associated with Tetrahedrite on mindat.org. Bournonite 3 photos of Rozenite associated with Bournonite on mindat.org. Arsenopyrite 3 photos of Rozenite associated with Arsenopyrite on mindat.org. Galena 2 photos of Rozenite associated with Galena on mindat.org. Sulphur 1 photo of Rozenite associated with Sulphur on mindat.org. 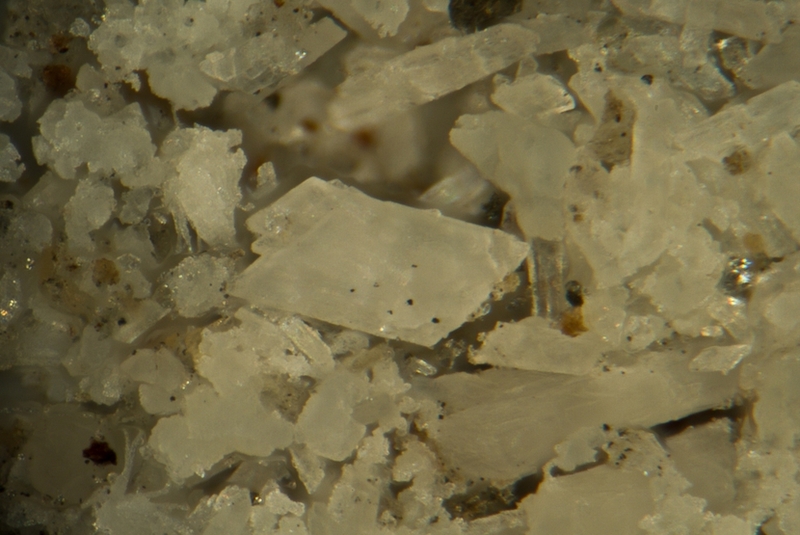 Halotrichite 1 photo of Rozenite associated with Halotrichite on mindat.org. Bílinite 1 photo of Rozenite associated with Bílinite on mindat.org. 25.10.3 Siderotil FeSO4 · 5H2O Tric. 25.10.18 Fibroferrite Fe3+(SO4)(OH) · 5H2O Mon. Jambor, J.L. and Traill, R.J. (1963) On rozenite and siderotil. Canadian Mineralogist: 7: 751-763. American Mineralogist (1964): 49: 820. Bayliss, P. (1987) Mineral nomenclature: rozenite. Mineral. Mag., 51, 176. Peterson, R.C. (2003) Dehydration of mine waste. The relationship among melanterite FeSO4·7H2O, siderotil FeSO4·5H2O and rozenite FeSO4·4H2O. Geological Association of Canada-Mineralogical Association of Canada-Society of Economic Geologists Abstracts Volume 28: 134-135. Li, X., Liu, X., Ju, Y., & Huang, F. (2003). Properties of soils in Grove Mountains, East Antarctica. Science in China Series D: Earth Sciences, 46(7), 683-693. Thienenkamp, M. (2004). Post-closure mine hydrology and its impact on underground tailings disposal at the Thalanga mine, Queensland, Australia. Mine water, 85-90. Forsyth, B., Edraki, M., & Baumgartl, T. (2015). The Evolution of Tailings Seepage Chemistry at One of Australia’s Largest and Longest Operating Mines. In 10th International Conference on AcidRock Drainage and Annual IMWA Conference (pp. 1-11). Gecamin Digital Publications. Kolitsch, U. (2009): 1603) Rozenit und Skorodit von der ehemaligen Antimonitgrube bei Stadtschlaining, Burgenland. P. 224 in: Niedermayr, G. et al. (2009): Neue Mineralfunde aus Österreich LVIII. Carinthia II, 199/119, 189-236. Kolitsch, U. (2017): 2045) Melanterit, Pickeringit und Rozenit vom ehemaligen Graphitbergbau Zettlitz bei Drosendorf, Waldviertel, Niederösterreich. Pp. 263-264 in Walter, F. et al. (2017): Neue Mineralfunde aus Österreich LXVI. Carinthia II, 207./127., 217-284. Kolitsch, U. & Brandstätter, F. (2012): 1760) Greenockit(? ), Rozenit und Todorokit aus dem Marmorsteinbruch Renz bei Winkl, Neupölla, Waldviertel, Niederösterreich. Pp. 162-163 in Niedermayr, G. et al. (2012): Neue Mineralfunde aus Österreich LXI. Carinthia II, 202./122., 123-180. Bernhard, F. (2006): Slavikit, Rozenit, Gips, Jarosit und Pyrit vom Steinbruch Weisseneg bei Wildon, Steiermark. Der Steirische Mineralog, 20, 40. Taucher, J. & Moser, B. (1995): 999. Pickeringit, Rozenit, Szomolnokit und Gipskristalle vom ehemaligen Quarzabbau Ebenlecker, Herzogberg, Modriach, Koralpe, Steiermark. Pp. 164-165 in NIEDERMAYR, G., H.-P. BOJAR, F. BRANDSTÄTTER, V. M. F. HAMMER, B. MOSER, W. POSTL & J. TAUCHER (1995): Neue Mineralfunde aus Österreich XIVL. Carinthia II, 185./105., 145-168. Taucher, J. (2012): Hydroniumjarosit, Jarosit, Rozenit und Pickeringit vom Tagbau des aufgelassenen Magnesitbergbaues am Sattlerkogel, Veitsch, Steiermark. Der Steirische Mineralog 26, 59. Blaß, G. & Graf, H.W. (1993): Neue Funde. Mineralien-Welt, 4 (2), 57-60. Kolitsch, U. (2012): 1740) Hydrozinkit, Rozenit und Smithsonit vom alten Bergbau am Fellimännle, Rindertal (Gaflunatal), Montafon, Vorarlberg. P. 147 in Niedermayr, G. et al. (2012): Neue Mineralfunde aus Österreich LXI. Carinthia II, 202./122., 123-180.
van Tassel, R., (1979): Minéraux artificiels ou de néoformation à Plombières et Sclaigneaux, Belgique, Bulletin de la Societe Belge de Géologie, 88 (4), 273-279; Blaß, G. & Graf, H. W. (1995b): Neufunde von Schlackenhalden in der nördlichen Eifel (II). Mineralien-Welt, 6 (3), 28-31. Atanassova, R. & Kerestedjian, T. (2009): Efflorescent minerals from the metallurgical waste heaps of the KCM non-ferrous metal smelter, Plovdiv, Bulgaria. Geochemistry, Mineralogy and Petrology, 47, 51-63. INGELSON, A. (1984) Mineral occurrences in Western Canada. Mineralogical Record 15, 89-94. Sabina, A.P. (2015) Bay of Fundy, New Brunswick and Nova Scotia; South Shore, Nova Scotia. Geological Survey of Canada Popular Geoscience 97. Sabina, A.P. (2015) Rocks and minerals for the collector: Bay of Fundy, New Brunswick and Nova Scotia; South Shore, Nova Scotia. Geological Survey of Canada, Popular Geoscience 97: 456 pages. ⓘ Tilt Cove Slag Locality ? SABINA, A.P. (1976): Rocks & minerals for the collector: The Magdalen Islands, Quebec and the island of Newfoundland. Geological Survey of Canada Paper 75-36, 199p. Reissued in 2003 as Île de la Madeleine, Quebec, the Island of Newfoundland and Labrador. Geological Survey of Canada Miscellaneous Report 58, 94-97. Erwin L. Zodrow and Keith McCandlish, "Hydrated Sulfates in the Sydney Coalfiled, Cape Breton, Nova Scotia", Canadian Mineralogist, vol. 16, pp.17-22, 1978. Richardson, J.M. (1988) Genesis of the East Kemptville greisen-hosted tin deposit, Davis Lake complex, Southwestern Nova Scotia, Canada. Unpublished Ph.D. thesis, Carleton University: 293 pg. Izawa, M. R. M., Banerjee, N. R., Osinski, G. R., Flemming, R. L., Parnell, J., & Cockell, C. S. (2011). Weathering of post-impact hydrothermal deposits from the Haughton impact structure: implications for microbial colonization and biosignature preservation. Astrobiology, 11(6), 537-550. Sabina, A. P. (2007) Rocks and Minerals for the Collector, Ottawa to North Bay and Huntsville, Ontario; Gatineau (Hull) to Waltham and Témiscaming, Quebec. Geological Survey of Canada, Miscellaneous Report 48, 249 pages. SABINA, A.P. (2003): Rocks & Minerals for the collector; Kirkland Lake - Rouyn-Noranda - Val d'Or, Ontario & Quebec. GSC Misc. Report 77, 171. SABINA, A.P. (2003): Rocks & Minerals for the collector; Kirkland Lake - Rouyn-Noranda - Val d'Or, Ontario & Quebec. GSC Misc. Report 77, 179. Sabina, A.P. (2000) Rocks & Minerals for the collector; Cobalt - Belleterre - Timmins, Ontario and Quebec. GSC Misc. Report 57, 102-103 p.
Sabina, A.P. 1967. Rocks and minerals for the collector: Eastern Townships and Gaspé, Quebec; and parts of New Brunswick. Geological Survey of Canada Paper 66-51, 38. Sabina, A.P. (1986) Rocks & Minerals for the collector; Buckingham - Mont-Laurier - Grenville, Quebec Hawkesbury - Ottawa, Ontario. Geological Survey of Canada, Miscellaneous Report 33, 51. Sabina, A.P. (1983) Rocks & minerals for the collector: Kingston Ontario to Lac Saint-Jean, Quebec. GSC Misc. Report 32, 74-75. Geological Survey of Canada Miscellaneous Report 41 (1987). SABINA, A.P. (1987) Rocks & Minerals for the collector; Hull-Maniwaki, Quebec, Ottawa-Peterborough, Ontario. GSC Misc. Report 41, 37-38. Sabina, A.P. (1972) Rocks & minerals for the collector: The Alaska Highway, Dawson Creek, British Columbia to Yukon/Alaska border. GSC paper 72-32. Reissued (1992) as GSC Miscellaneous Report 50, 55-67. Kampf, A. R., Mills, S. J., Nash, B. P., Housley, R. M., Rossman, G. R., Dini, M. and Gatta G.D. (2013): Camaronesite, [Fe3+(H2O)2(PO3OH)]2(SO4)•1–2H2O, a new phosphate-sulfate from the Camarones Valley, Chile, structurally related to taranakite. Mineralogical Magazine 77, 453-465. Meixiang, Z., & Wei, T. (1987). Surface hydrothermal minerals and their distribution in the Tengchong geothermal area, China. Geothermics, 16(2), 181-195.
ⓘ Rio del Callejon deposit ? Zwahr, H. & Gonzales, R. (1999): Secondary sulfate mineralization of the kaolin deposit of Rio del Callejon, Cuba. Zeitschrift für Geologische Wissenschaften 27, 219-233. Matýsek D., Jirásek J., Osovský M., Skupien P.. Minerals formed by the weathering of sulfides in mines of the Czech part of the Upper Silesian Basin. Mineralogical Magazine, 2014, 78, 5, 1265-1286. Pašava, J., Breiter, K., Huka, M., Korecký, J.: Parageneze druhotných železnatých, hořečnatých a manganatých síranů z Chvaletic. Věstník Ústředního ústavu geologického, 1986, roč. 61, č. 2, s. 73-82. Jakobsen, U.H. (1989) Hydrated Iron Sulphate Occurrences at Navarana Fjord, Central North Greenland. Bull. Geol. Soc. Denmark, v. 37, pp. 175-180. Vorma, Atso (1966): Rozenite-iron sulphate tetrahydrate-as fissure coatings in the black schist at Mulo, Pyhäselkä in Eastern Finland. Comptes rendus de la Société Géologique de Finlande, XXXVIII (1966), pp. 51-53. Minéralogie de la mine des malines (Daniel Gol, Alain Martaud, Nicolas Meisser, Pascal Chollet) - Le regne minéral, H.S. XVI, pp 49-86. - Gol, D, Martaud, A., Meisser, N. & Chollet, P. (2010): Minéralogie des Malines, Gard. Le Règne Minéral, HS XVI, 49-88. Bourgoin, V., Favreau, G., Boulliard, J.-C. (2011): Jas Roux: un gisement exceptionnel à minéraux de thallium. Le Cahier des Micromonteurs, 3-2011, 2-91. Schnorrer-Köhler, G. (1986) Neue Minerale von der Schlackenhalde der ehemaligen Zinkhütte Genna in Letmathe/Sauerland. Aufschluss, 37 (2), 55-67.; Bender, D. and Krimmelbein, W. (1994) Aktuelle Übersicht: Mineralien der Zinkhütte Genna/Sauerland. Stand Juni 1994. Mineralien-Welt, 4/94, 10. Gröbner, J., W. Hajek, R. Junker & J. Nikoleizig (2011). Neue Mineralienschätze des Harzes. S.71. Papierflieger-Verlag, Clausthal-Zellerfeld. Skarpelis, N., & Triantafyllidis, S. (2004). Environmental impact from supergene alteration and exploitation of a high sulphidation epithermal type mineralisation (Kirki, NE Greece). Applied Earth Science, 113(1), 110-116. Triantafyllidis, S. & Skarpelis, N. (2006): Mineral formation in an acid pit lake from a high-sulfidation ore deposit: Kirki, NE Greece. Journal of Geochemical Exploration 88, 68-71. Szakáll & Jánosi: Minerals of Hungary, 1995; Sánoor Szakáll, Mária Foldvári, Gábor Papp, Péter Kovács-pálffy, Árpád Kovács (1997) Secondary Sulphate Minerals From Hungary. Acta Mineralogica-petrographica, Szeged, Xxxviii, Supplementum, 7-63. Szakáll & Jánosi (1996): Minerals of Hungary. Topographia mineralogica Hungariae 4. Herman Ottó Museum, 1996, 130p. Szakáll, S., Jánosi, M. (1996) Minerals of Hungary. Topographia Mineralogica Hungariae IV. Herman Ottó Museum, 1996, 130 pages. Scaini G. (1971): L'alunogeno della miniera del Nibbio a Mergozzo (Ossola). Natura, 42, (2), 230-231.; Mattioli V. (1979): Minerali Ossolani. Ed. Arti Grafiche Medesi, Milano, 268 pp. 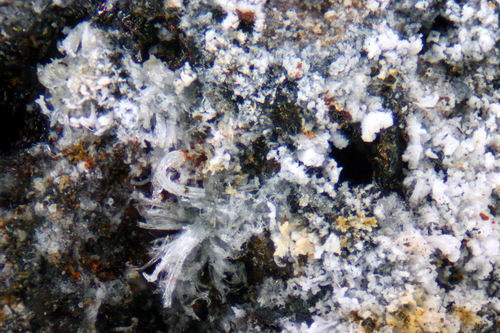 Mineralogical Record, 15 (1), 27-36. Forti P., Menichetti M., Rossi A. (1989): Speleothems and speleogenesis of the Faggeto Tondo Cave (Umbria, Italy). Proceedings of the 10th International Congress of Speleology, Budapest, 1, 74-76. [Rieck, B. (1993) - Famous mineral localities: Allchar, Macedonia, Mineralogical Record, 24 (6), 437-449]; Boevl, B., Bermanec, V., Serafimovski, T., Lepitkoval, S., & Mikulcic, S. (2001). Allchar Mineral Assemblage. Geologica Macedonica, Vol. 15-16, p. 1-23 (2001-2002) Suppl; Boev, I., Šorša, A., Tasev, G., Serafimovski, D., & Boev, B. (2017). Mineralogy and geochemistry of trace elements from Crven Dol–Alšar deposit (Republic of Macedonia). Geologica Macedonica, 31(1), 5-20. Kolitsch, U., Đorđević, T., Tasev, G., Serafimovski, T., Boev, I., Boev, B. (2018): Supergene mineralogy of the Lojane Sb-As-Cr deposit, Republic of Macedonia: Tracing the mobilization of toxic metals. Geologica Macedonica 32, 95-117. Neumann, H. (1985): Norges Mineraler. Norges Geologiske Undersøkelse Skrifter 68, p 108. Identified by Harald Folvik, Natural History Museum 2014, Markus Reime specimen; Larsen, K. E. (2015). Noen funn av mineraler i Norge 2013-2015. Norsk Mineralsymposium 2015, 79-88. Petersen, S., Herzig, P. M., Hannington, M. D., Jonasson, I. R., & Arribas, A. (2002). Submarine gold mineralization near Lihir Island, New Ireland fore-arc, Papua New Guinea. Economic Geology, 97(8), 1795-1813. Ciesielczuk, J., Żaba, J., Bzowska, G., Gaidzik, K., & Głogowska, M. (2013). Sulphate efflorescences at the geyser near Pinchollo, southern Peru. Journal of South American Earth Sciences, 42, 186-193. Smuda, Jochen; Dold, Bernhard; Friese, Kurt; Morgenstern, Peter; Glaesser, Walter (2007): Mineralogical and geochemical study of element mobility at the sulfide-​rich Excelsior waste rock dump from the polymetallic Zn-​Pb-​(Ag-​Bi-​Cu) ore deposit, Cerro de Pasco, Peru. Journal of Geochemical Exploration, 92, 97-110. Álvarez-Valero, A. M., Pérez-López, R., Matos, J., Capitán, M. A., Nieto, J. M., Sáez, R., ... & Caraballo, M. (2008). Potential environmental impact at São Domingos mining district (Iberian Pyrite Belt, SW Iberian Peninsula): evidence from a chemical and mineralogical characterization. Environmental Geology, 55(8), 1797-1809. Apopei, A.I., Buzgar, N., Damian, G., Buzatu, A. (2005): The Raman study of weathering minerals from the Coranda-Hondol open pit (Certej gold-silver deposit) and their photochemical degradation products under laser irradiation. Canadian MIneralogist, 52, 1027-1038. Andrei I. Apopei, Nicolae Buzgar, Gheorghe Damian, and Andrei Buzatu (2014) the Raman Study of Weathering Minerals from the Coranda-Hondol Open Pit (Certej Gold-silver Deposit) and Their Photochemical Degradation Products Under Laser Irradiation. Can Mineral 52:1027-1038. Blinov, I. A., Belogub, E. V., Novoselov, K. A., & Philippova, K. A. (2011). Antropogenic Supergenic Mineral of Verhne Arshinskoe Lead Zinc Deposit (Bashkortostan). Башкирский химический журнал, 18(4). Smirnov A., 2000: Sb-Au mineralizácia v okolí Nižnej Boce (Nízke Tatry), Diplomová práca, archív Prif UK, Bratislava, 131p. ⓘ Sot de les Mines ? Krähenbühl H. (1987). Die Vitriol- und Schwefelgewinnung in Graubünden. Bergknappe 40, 12-20. Stalder, H. A., Wagner, A., Graeser, S. and Stuker, P. (1998): "Mineralienlexikon der Schweiz", Wepf (Basel), p. 352. Bächtiger K. (1986): Der alte Goldbergbau an der «Goldenen Sonne» am Calanda bei Chur. Bergknappe 38, 2-14. Murdoch, Joseph & Robert W. Webb (1966), Minerals of California, Centennial Volume (1866-1966): California Division Mines & Geology Bulletin 189: 324; Pemberton, H. Earl (1983), Minerals of California; Van Nostrand Reinholt Press: 271. SDSU Geology Department unpublished field trip guide, circa 1980. Gross, E.B., Chesterman, C.W., Dunning, G.E., and Cooper, J.F. (1967) Mineralogy of the Kalkar quarry, Santa Cruz, California. California Division Mines and Geol. Special Report 92: 3-10; Pemberton, H. Earl (1983), Minerals of California; Van Nostrand Reinholt Press: 138, 272, 321; Dunning, G.E. and Cooper, J.F. (1986): Mineralogy of the Kalkar Quarry, Santa Cruz, California. Mineralogical Record, 17(5), 315-326. Majzlan, J., Alpers, C. N., Koch, C. B., McCleskey, R. B., Myneni, S. C., & Neil, J. M. (2011). Vibrational, X-ray absorption, and Mössbauer spectra of sulfate minerals from the weathered massive sulfide deposit at Iron Mountain, California. Chemical Geology, 284(3), 296-305. Tien, P. L. (1967). An occurrence of rozenite in Kansas. Transactions of the Kansas Academy of Science (1903-), 70(2), 219-222. Robert Matthew Joeckel, K. D. Wally, S.A. Fischbein, P.R. Hanson (2007) Sulfate Mineral Paragenesis in Pennsylvanian Rocks and The Occurrence of Slavikite in Nebraska. REAT PLAINS RESEARCH 17:1 pages 17-33 (Spring 2007). ⓘ Glen Echo Ravine ? Reed, Juliet C. (1976), Annotated Biblio. of Mins New to the Pa List 1965-1974, The Mineralogical Soc. of PA, Inc.: 69; Montgomery, A. (Dec, 1972 & Jan, 1973), "Pa Mins" (PM), PM(120) & (121), Keystone Newsletter. Coskren, T. D. & Lauf, R. J. (2000): The Minerals of Alum Cave Bluff, Great Smoky Mountains, Tennessee. Mineralogical Record, 31, 163-175.; Flohr, M.J.K., Dillenburg, R.G., and Plumlee, G.S. (1995): Characterization of secondary minerals formed as the result of weathering of the Anakeesta Formation, Alum Cave, Great Smoky Mountains National Park, Tennessee: USGS Open File Report #95-477, 24 p.
Patrick Haynes. ID via the late Howard Evans, Jr.